The day started pretty early (for a weekend) today as I was participating in a mixed doubles badminton tournament in Brickfields, Kuala Lumpur. 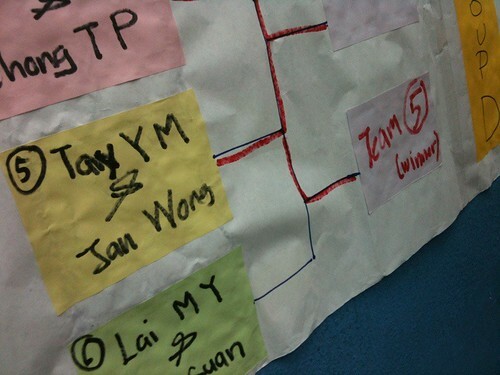 I was looking forward to it as it has been quite some time since I last played in a tournament (5 years, at least?). Things started out pretty well until a heavy downpour bringing strong winds blowing through the windows and worse of all – a leaking roof, soaking different sections of the court. It was a struggle battling against mother nature herself apart from the game but we managed! Despite all odds we came in 3rd with a mini bronze trophy to go home with although we could have done better in the semi finals. I would say that we were pretty close in reaching the finals but we kinda gave it away. Nevertheless, it was definitely a fun experience and different from the ones in the past as it was also my first tournament with her! Am glad we managed to progress this far into the tournament since there weren’t many ‘training sessions’ prior to this. There we have it! The entire Saturday dedicated to a day-long tournament with a Bronze finish! It’s now time to kick back, relax and recuperate. How was YOUR Saturday? Hope your weekend has been productive thus far!